The 2015 Summer Art Series features the work of five Cazenovia alumni, including two past Photography students Kathleen Deep '10 and Hannah Morse Leeber '10. Both photographers showed a strong display of work that is conceptually sound and visually intriguing. 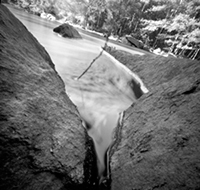 Kathleen Deep '10 featured large scale black and white photographs of the landscape. The skewed perspectives and shifts in focus leave the viewer in a state of unease as we begin to question the familiar landscape. Deep currently teaches photography at the University of Connecticut where she received her MFA in Photography. Hannah Morse Leeber '10 featured a series of photographs that captured the lives of widows and widowers. The quiet, contemplative photographs show the personal side of the stage in life that we often find too difficult to discuss. Leeber currently teaches at Notre Dame High School and completed her MFA at Savannah College of Art and Design. To learn more about the exhibit and the artists visit the Art Gallery Website.